Nose Print, Paw Print & fingerprint Jewelry! Announcement Custom Nose Print Necklace? Custom Paw Print Keychain? Baby Footprint Charm on your Necklace? Why... Yes! We think everyone should have one (or two or three)!!! All of our items are hand-made with high quality materials and attention to detail. From Specific Dog Breed Necklaces and Earrings, to Custom Nose Print, Paw Print, Fingerprint, Hand and Foot Print jewelry! Grab a one-of-a-kind item and start a collection today! Current production time is 2-3 weeks in the studio. If you need a gift for a special occasion - please contact us to be sure that we can accommodate your needs! Custom Nose Print Necklace? Custom Paw Print Keychain? 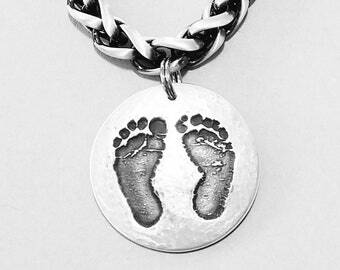 Baby Footprint Charm on your Necklace? Why... Yes! We think everyone should have one (or two or three)!!! Dog Nose Bracelet Component, without beads. Hide Your Crazy Bracelet - Act like a Lady! This is the 3rd product I have ordered from them. The products they make are truly wonderful! What a beautiful way to remember a fur baby. The products are of exceptional quality! Gigi was so helpful, I was trying to get a print of my daughter's polydactyl 6 mo old kitten and it wasn't easy. Time was running out for it to arrive for a Christmas present and I was going to give up, but Gigi encouraged me to give it one more try and promised to get it to me by Christmas. She did not disappoint. What a great experience. Love, love, love how it turned out. Highly recommend trusting Gigi and Funky Dog with any order. Welcome to The Funky Dog! We love all things canine, all things tiny human and, all things Jewelry - Soooo, we combined our talents and our interests to bring you The Funky Dog shop! We are constantly inspired by our amazing kiddo who is always ready for adventure and, our two furry boys who keep us laughing. Didgeridoo, our 15 year old Cattle Dog will do ANYthing for a tennis ball and Blueie Underpants, our Mini- Aussie will wiggle his little nublet off for a run in nature or a belly scratch. All three children are right at home in the studio (two of them under our feet) while we cut, grind, solder, buff and hammer all day! New designs are always on the horizon so, check back often and share with your friends! If you’d like to see a new breed, send us a message! We welcome special orders and encourage you to be a part of the process! If you'd like to customize an item just let us know and we’ll collaborate on a one-of-a-kind piece, just for you! We want you to be really, really happy. If you feel that your purchase has not met or exceeded your expectations, please feel free to contact us to discuss any possible options. Please contact us through Etsy only. All jewelry is guaranteed to be free of defects in craftsmanship and materials upon arrival. Should the jewelry be faulty and examination (by the seller) reveal it is due to negligence on our part, the item will be repaired or replaced at no additional cost. *All Custom Jewelry is non-refundable. We create all jewelry as it is ordered. We do not "stock" anything. Each piece is made individually just for you! 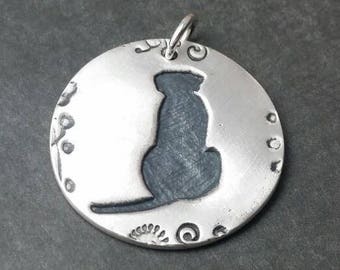 Any item that has been created, modified or altered, including all Nose print, Paw print, Fingerprint, Hand and Foot print jewelry is yours to keep! Due to the fact that we generally ship the same day you order (the mold or print kit for custom pieces or, a finished product) we do not accept cancellations. Most orders can be filled within 3-5 business days. Some orders require return of molds or prints to us. These orders will ship with-in 2-3 weeks after return of necessary items. We use USPS First Class with insurance for your purchases. Sometimes we offer expedited shipping for an additional fee. Please convo us for details. All international orders require customs forms and these will be filled out completely and truthfully! Any customs hold imposed by the country of destination is out of our control. Any duty imposed by the country of destination is out of our control.